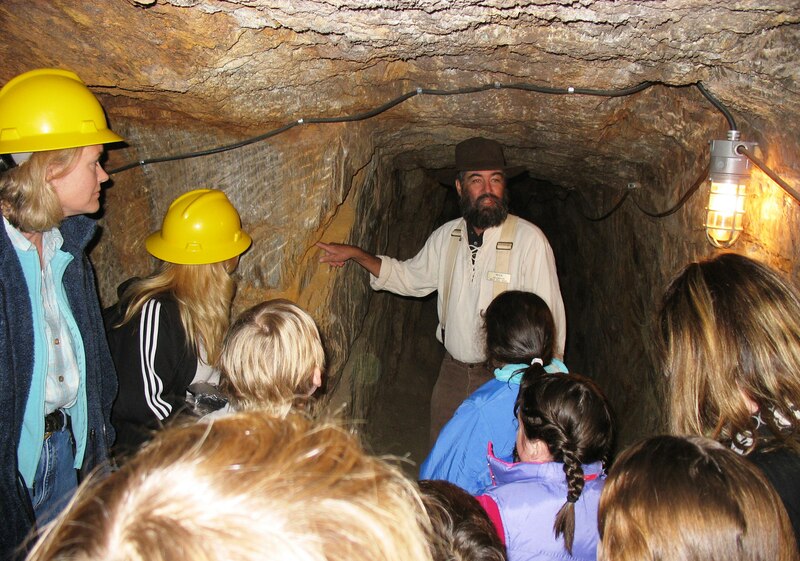 Placerville's Gold Bug Mine and Museum showcases the history of gold mining in the area. The Wagon Train and Overland Trail Ride has been a community heritage program in Placerville for more than 60 years. Placerville, California, (population 10,300) is nestled in the foothills of the Sierra Nevada Mountains. In 1848, gold was discovered on the American River near Placerville. The gold rush quickly populated the town, soon known as Dry Diggins, and by 1854 it had the third largest population in the state. A very vigorous economy developed and by the early 1850s the town had a fire department, post office, newspaper, and a Pony Express and Wells Fargo stage office. Notables who arrived included Mark Twain, Levi Strauss, and John Studebaker. Those who resorted to unlawful deeds met their end by hanging. In 1854, Dry Diggins’ name was changed to Old Hangtown, and it became the El Dorado county seat. Subsequently, the name was changed to Placerville, reflecting the city’s gold mining heritage. Placerville was and is the hub of the Mother Lode and gateway to the Sierras and California’s central valley. As mining declined, the lumber industry, ranching, and agriculture, including fruit orchards and vineyards, thrived. Main Street in Placerville still retains a majority of the buildings of the 1800s, and Hangtown Creek, where the 49ers panned for gold, still flows past the town. The city-owned and operated Gold Bug Mine and Museum showcases the history of gold mining in the area. The El Dorado County Historical Society owns and operates the Fountain & Tallman Museum in one of the oldest structures (1852) still standing on Placerville’s Main Street. A historic resources inventory was digitized in 2012 and linked to the city’s Web site for convenient community access. Each year when the Wagon Train parade arrives, the town proudly celebrates its historical past. The Wagon Train and overland trail ride has been a Placerville community program for 63 years. The wagons typically assemble at the south shore of Lake Tahoe at Zephyr Cove, Nevada, in early June, and then travel over the Sierra Nevada Mountains by way of the same route the early frontier travelers took in the 1840s. 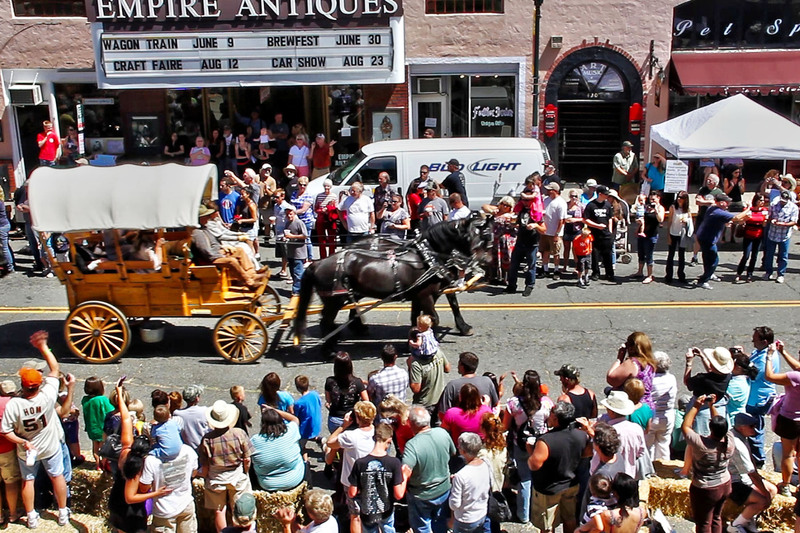 Authentically dressed participants, costumed as frontiersmen and women, miners, cowboys, Native Americans, and Pony Express riders are welcomed into communities along the route, ending in Placerville. Local organizations and politicians join the procession, and the windows of shops along Main Street are decorated with historical displays. Many locals and merchants put on western wear, conduct living history reenactments, and sponsor associated events such as a dance, a cook-off, and gold panning for children. Large numbers of visitors and locals frequent city businesses while enjoying the heritage celebration.